Alex is an incredible 4 year old boy whose smile and outgoing personality bring joy to anyone who is lucky enough to know him. He is constantly laughing and singing and has never met a stranger who did not become a friend. He loves to walk in the park with his mommy and have a lightsaber duel with his daddy! But we were not always sure that he would ever be able to do those things, or in fact be able to do most things that a typical 4 year old loves to do. You see, Alex was born with a neuromuscular disease that limits his ability to enjoy all of the motor skills that we all take for granted every day. Alex has something called Charcot-Marie-Tooth Syndrome, a disease that prevents his muscles from getting the signals that his brain sends through his nerves. The doctors were not sure what could be done or how extensive the damage would be. We were told to brace ourselves for the possibility that he might never be able to walk or run like other boys. Our hearts were hurting and we were full of sadness. Then someone suggested we look into hippotherapy before we gave up all hope. We did some research and decided that it was worth a shot. I am so thankful that we did! Rising Hope Farm has been the single greatest influence on our son’s physical health, and we give thanks every day for the gift of love that the caring and devoted staff there have given our little boy! I remember Alex’s first visit to the Farm and the first time that he was ever face to face with such a large animal as a horse. We thought that he would be afraid, but instead he went right up to one of them and reached out his little hand to rub the horse’s nose. It was an instant connection that would bring so much joy and hope to our lives! After only two sessions with Gail and her team, people who had known Alex since birth were coming up to us and remarking on how much better he was balancing himself and how much straighter he was trying to walk. As our sessions continued, Alex blossomed not only physically, but emotionally as well. There was an added confidence in him and he was not afraid to try to do things that he was not able to do before. 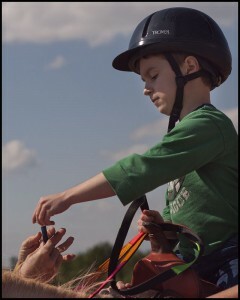 Eventually, with the help of the team and the horses, Alex was able to walk independently of holding someone’s hand! Imagine the joy that shot through all of our hearts when we were able to witness this incredible little boy do what we were told he might not ever be able to do! The improvements just kept coming and we were amazed how far he had come in just a few short months of this horse therapy. But as it always does, the Fall turned into the Winter, and we had to stop our weekly sessions. 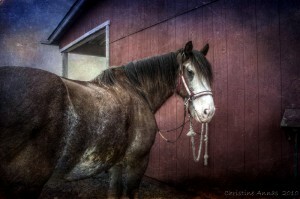 Without the indoor riding shelter, there was no way to protect the riders or the horses or the staff from the elements. This made Alex so sad since he would not get to see the horses and the wonderful new friends that he had come to love. But his sadness was not the worst of it. Without the therapy, Alex began to have regressions in the new skills that he had learned. He began to fall more and walk less. His gait became increasingly unsteady as the cold months continued and by the time that the next year’s sessions were to begin, he had lost much of the balance and core strength that he had gained. The falls worried him and he began to be afraid again of trying to do new things. Everyone around him noticed a difference and all were worried. The doctors began to talk of shots into his legs and of surgery. Imagine having to watch your child being stabbed with an electrified needle over and over again and not be able to do anything about it. To watch him cry till he could no longer breathe because they had to figure out why he was regressing so strongly. Now imagine holding your child in the night as he awakes screaming from a nightmare that is a memory of what the doctors had to do and what you had to allow. We didn’t have to imagine it, we lived it. We were so happy when it was time to register him for the new season of therapy,and happily the new season of riding is upon us and Alex is back in the saddle again! It has been but mere weeks and already Alex is walking straight again and his core muscles are holding him stronger! The muscles that he uses to sit up straight and hold on well while he is riding are the same muscles that were deemed weakest by the doctors. Alex is so happy to be back amongst the amazing team of people who helped him get so far the year before and are helping him makes improvements by leaps and bounds this year. Already Alex is trying to learn to run, whereas before he was afraid to move that fast for fear of falling. A child that medicine was not sure they could really help is learning how to balance himself enough to jump with both feet off of the ground! It is a small miracle that we all take for granted every day. I cannot imagine where we would be if it were not for Gail and her wonderful team. She puts so much of herself out there every day; not for her own glory, but to enhance the lives of extraordinary children with special needs! She works so hard just to see that moment when it all comes together and a child’s life is changed forever for the better. Children who might never have known what it felt like to walk have been given a chance to fly thanks to Rising Hope Farms. I imagine how much more amazing their lives could be if there was a place for them when things turned cold, a place where they didn’t have to give up their sessions because of the weather. I imagine what wonderful and inspiring things these kids could do if we could build an indoor riding ring where we could work together year round to help keep these amazing children from regressing the way Alex did during the Winter months. They would never have to lose the skills that they had worked so hard to gain during the previous months, they could just keep moving forward! Then they would never have to go through the pain and the nightmares that my own son had to live through, because they would never be forced to give up the riding sessions that brought such unexpected hope into all of our lives. There is no way for us to give back to Rising Hope Farm as much as they have given to Alex, but we want to say “Thank You” to Gail and all of her team for all that they give of themselves just to see a child’s life improve. I once asked Alex what it felt like to ride a horse. 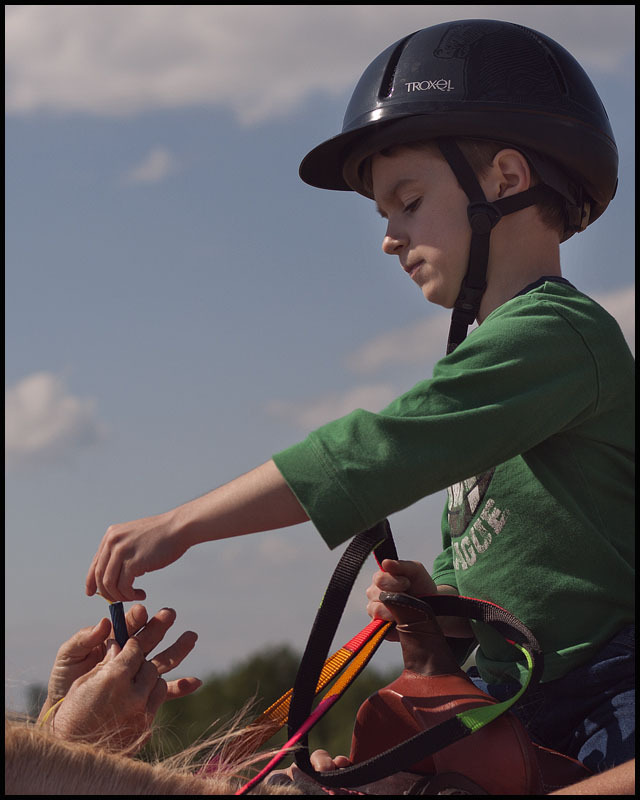 He looked up at me with big eyes and an even bigger smile and said, ” It’s like I can fly!” We will do anything we are able to do to make sure that they can build that indoor riding ring at Rising Hope Farm, because they have given our children wings to soar! My experience with Rising Hope Farms began just this May. But what wonderful experiences they’ve been. I’ve loved horses since childhood and being able to serve God’s special people at the same time has been a thrill. 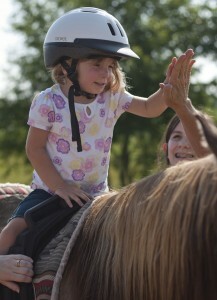 I’ve seen children go from quiet and scared to wide-eyed and joyful after the first few steps of the horse. 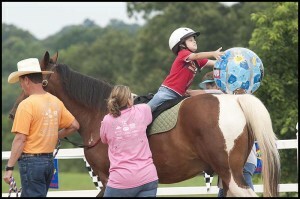 Only God knows the encouragement and healing these horses bring to these children’s lives. What a blessing to be a part of this ministry. Sir Winston Churchill once said “There’s something about the outside of a horse that’s good for the inside of a man.” I couldn’t say it any better! Summer Houldin is 3 1/2 years old and is a little sister to Natalie, 5 and Kaylen, 8. Summer was born prematurely and had to spend the first 3 months of her life in the neonatal intensive care unit at Carolina Medical Center. Summer has had numerous hospitalizations and operations since her birth, her fist major surgery was when she was only 3 days old. In all, she survived over 8 major operations, including open heart surgery. Summers recovery has been attributed to lots of support from family, friends, neighbors and nurses. Summer also has 5 dedicated therapists who all have the common goal of preparing her to be mainstreamed into school. They all have different areas of expertise that help Summer improve with her overall development. Summer also has a very special relationship with the horses that help her emotionally as well as physically. 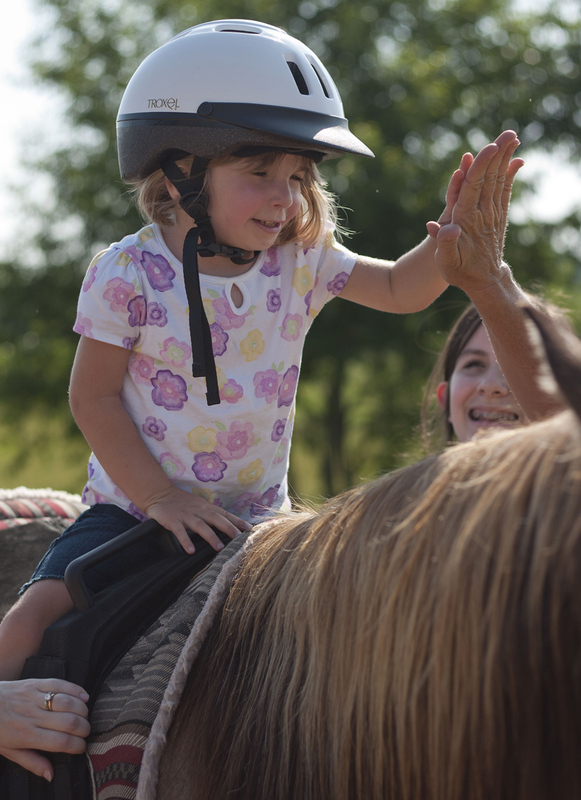 Since starting the therapeutic riding program provided by Rising Hope Farms Summer has made dramatic improvements in her physical abilities such as walking, balance, muscle tone and has definitely gained self confidence and a more outgoing personality. The dedicated staff and volunteers of Rising Hope Farm have been a blessing to our family and have greatly impacted the lives of the children they help serve. The implementation of Rising Hope’s therapeutic horseback riding program has been Gift from God for His children, no matter what age. My son Bradley has Duchenne Muscular Dystrophy which weakens his muscles. He began therapeutic horse back riding at Rising Hope Farm last spring with the hope that it would help him maintain his strength and improve his flexibility. Riding at the farm has done just that. Brad’s balance has improved tremendously since he began riding. His flexibility is great and he loves coming to the farm. He is more confident now and being able to ride a horse makes him feel so special. He loves to give the horses treats and really looks forward to seeing Buddy the dog. He has accomplished things on the horse that I never thought possible. Gail and the volunteers really care about Bradley. Everyone there has been a tremendous blessing to our family.